The past few years have been a nightmare for the once-mighty Sears. Now some are worried that bankruptcy may be next. NEW YORK (CNNMoney) -- The future is looking increasingly bleak for the former king of retail, Sears Holdings. Shares of Sears (SHLD, Fortune 500) are trading near their lowest levels since John Kerry won the Iowa Caucus and New Hampshire Primary for the Democrats in 2004. The retailer, which also owns Kmart as well as the Kenmore, Craftsman and Lands' End brands, announced shortly after Christmas that it was planning to close 100 to 120 Sears and Kmart stores. The news seems to be getting worse. Sears shares initially fell Thursday after Bloomberg reported that financial firm CIT Group (CIT, Fortune 500) had halted lending to Sears suppliers due to concerns about whether those vendors will get paid. But the stock staged a late day rally to finish more than 3% higher. CIT said that it does not comment on specific customers. Sears would not comment about the Bloomberg report either. But it appeared to confirm it was true in a backdoor kind of way. In a statement, a Sears spokesperson said it disagreed with CIT's actions and that CIT payables affected less than 5% of Sears' inventories. "Sears Holdings has more than adequate liquidity and ample resources at our disposal which give us significant financial flexibility," the spokesperson said, adding that it is "important to separate disappointing operating performance with liquidity." The Sears spokesperson said that the company ended December with $4.2 billion in liquidity. That may not be enough to reassure jittery investors who have increasingly soured on the company. The stock is cheaper than one of Kmart's trademark Blue Light Specials. Shares have plunged nearly 60% in just the past year. Paul Swinand, an analyst with Morningstar in Chicago (essentially Sears' hometown), said CIT may not be the start of a trend. He suggested that the company now run by former Merrill Lynch head John Thain may be acting overly conservative because it went bankrupt in 2009. So you can forgive it for being more risk averse than other lenders. But Swinand said Sears has to turn its fortunes around or suppliers could become less willing to continue selling goods through Sears and Kmart stores. Sears is expected to report massive losses this fiscal year and analysts are also forecasting a decline in sales. Vendors could run out of patience. "When people talk about a retail death spiral, it starts when vendors start tightening shipments because you could lose the ability to get the best merchandise," he said. "The worry is that if Sears keeps piling up losses, you have to wonder what companies like Electrolux or Whirlpool might do." That would be a disaster if these and other suppliers pulled the plug on Sears. The "death spiral" that Swinand refers to is essentially what happened in the past few years to Linens 'n Things, Circuit City, Borders, and most recently, Filene's Basement parent Syms. All four retailers eventually filed for bankruptcy and were forced to liquidate. Could Sears actually fall into bankruptcy as a result of its financial problems? It's still a long shot but it probably can't be completely ruled out. Greg Melich, an analyst with ISI Group in New York, wrote in a report earlier this week that he pegged the chances of a Sears bankruptcy filing sometime in 2012 at about 10% to 15%. He wrote that the more likely scenario is that the company is "modestly successful" with store closings and inventory reduction. The sad thing though is that even if Sears avoids Chapter 11, or worse, outright liquidation, Melich still doesn't think the stock is worth buying. He wrote that Sears has been "in a zombie state for years." 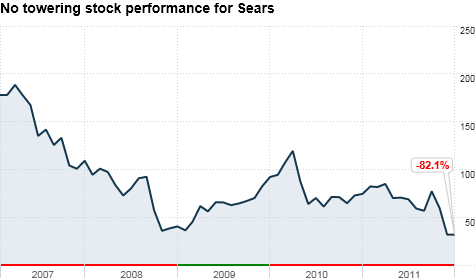 The long, slow decline of Sears is quite astonishing. There are eerie parallels to Eastman Kodak (EK, Fortune 500), which like Sears is an iconic American brand that was in the Dow Jones industrial average not that long ago and is now facing bankruptcy rumors. Both Sears and Kodak never really made the transition to the digital age. You can argue that Amazon (AMZN, Fortune 500) is as much a reason for sluggish sales at Sears as competition from the likes of Wal-Mart (WMT, Fortune 500) and Target (TGT, Fortune 500). The one saving grace for Sears investors could be that its land may be worth a lot if the company ever did decide to restructure through bankruptcy or asset sales. Sears chairman Eddie Lampert, who is also the company's largest investor, was praised in 2005 for merging Kmart with Sears. Many investors thought then (and still think now) that Sears is more like a real estate investment trust than a retailer. And for what it's worth, Lampert disclosed in an SEC filing late Wednesday that he personally bought more shares of Sears from ESL Investments, one of the hedge funds that he controls. But if Sears and Kmart cannot turn sales around, the company may perversely be better off going bankrupt. Swinand noted that when Syms filed for bankruptcy last year, shares originally dipped on the news but then rallied as investors realized that the liquidation process was likely to lead to gains for stockholders. "If you are losing money perpetually but if you have great assets, you could be worth more under a restructuring," he said. Of course, the more than 300,000 employees of Sears would vehemently disagree. So here's hoping that Sears does get back on track. There's too much at stake for the economy if a company this large went under. Best of StockTwits and reader comments of the week. Bank of America is amazingly the early candidate for 2012 stock of the year. And the dollar is starting to slip against the euro again. That was dominating the trader chatter Thursday. It's a valid point. And I'll admit to be being a card-carrying member of the BofA hater club. I realize that BofA (BAC, Fortune 500) is probably oversold. And it is in better shape now than 2008. But I still am not convinced there could be that much upside in the near-term. As long as Europe's debt crisis rages on and the Countrywide/mortgage bond legal headaches are an issue, I'd be wary of buying into any BofA bounce. TheArmoTrader: $EURUSD - I know the correlation has gotten weak, but given the fact that Euro has rallied so strong, surprised at weakness of market a bit. TheArmoTrader is correct to note that the knee-jerk reaction for the past year or so has been for stocks to rally on euro strength and dollar weakness. It seemed that any time the dollar slipped, investors felt that it would be good for the profits of large U.S. multinationals and was also a sign that the market was willing to embrace riskier assets. But I agree with Keith. A currency should be a gauge of the health of the country issuing it. A weak dollar should not be paradoxically viewed as an encouraging sign for the U.S.. Finally, an early reader comment of the week nod since I will be out on Friday and on Monday. I'm in a magnanimous mood (staring a 4-day weekend in the face does that to a guy) so I am handing out two. I wrote yesterday about the continued woes of Hank Paulson's favorite taxpayer-funded mortgage giants. 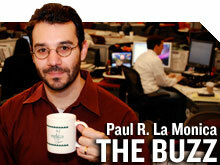 The headline was Can anyone save Fannie Mae and Freddie Mac? A guy with the Twitter handle of @LWinthorpe, an homage to the classic comedy Trading Places, tapped into my (and much of America's) latest obsession. "Can somebody save Fannie Mae and Freddie Mac? Please? << Tebow?" Very funny Louis. If the Broncos beat the Pats than maybe Tebow can pull off another miracle with Fannie (FNMA, Fortune 500) and Freddie (FMCC, Fortune 500). But I'm really wondering what you and Billy Ray Valentine think about OJ futures though. I bet you $1 you are behind the whole Brazil fungicide scare. Debra Lee, aka @catwoman2011, had an even better idea for a Fannie/Freddie white knight. "Only if $AAPL buys 'em!" Ahh. So that's what Apple (AAPL, Fortune 500) has been piling up all this cash for! iCDO? iMBS?